Salon covers a variety of topics, including reviews and articles about books, films, and music; articles about "modern life," including friendships, human sexual behavior, and relationships; and reviews and articles about technology, with a particular focus on the free and open-source software (FOSS) movement. 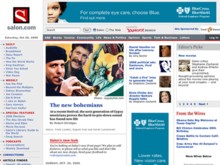 In July 2008, Salon launched Open Salon, a "social content site" and "curated blog network." It was nominated for a 2009 National Magazine Award in the category "best interactive feature." 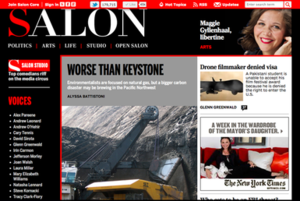 On March 9, 2015, Salon announced it would be closing Open Salon after six years of hosting a community of writers and bloggers. ^ "Salon.com WHOIS, DNS, & Domain Info – DomainTools". WHOIS. Retrieved October 14, 2016. ^ "Salon.com – News, Politics, Business, Technology & Culture". www.salon.com. Retrieved October 3, 2018.